The chile peppers are growing quickly in our garden. I watched no egrets pluck one small purple pepper off the stalk and eat it. “How is it?” I asked. “It’s a nice slow burn,” he said, as sweat started forming on his forehead. 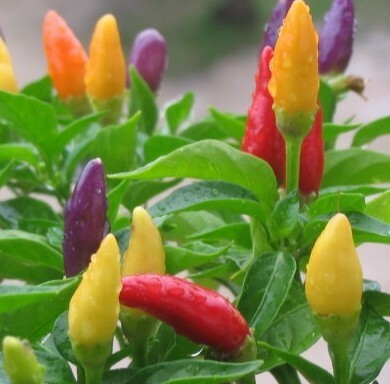 We have found peppers easy to grow and beautiful on the vine. No egrets started them as seedlings and now they are ouside in pots. The longer you wait before harvesting them (or eating them straight from the vine), the hotter they get. Slicing up peppers is fun, but don’t touch anything until you wash your hands. The chile oil, called capsaicin, burns. Should you get chile oil on your face or on other sensitive areas, use rubbing alcohol to dull the burn. Aloe vera and yogurt are two other soothers. Here are some tasty things to do with your harvest or CSA stash. Take an assortment of heirloom tomatoes (Non-heirloom tomatoes work well too, just make sure they are local, otherwise you risk pale pink tomatoes with the consistency of celery.) and dice very finely. Chop up an onion (I prefer a red onion for this, no egrets prefers Vidalia onions) and as many of your home-grown peppers as you can stand. Add a clove or three of garlic. Put them in a bowl with a handful of cilantro. Douse liberally in lime juice. * Add a good dollop of olive oil. At this point I usually add cumin, paprika, and a little chili powder for a diversity of spiciness and leave it at that. You could also add salt and pepper. *Lime note: I am not a true localvore, I just have localvore tendencies. To make this entirely local, you could use a local vinegar instead of lime. Green tomatoes can also add sourness. Dice a bunch of peaches and a small cucumber. Add a bunch of cilantro, lime juice, 2 Tablespoons of apricot preserves, and as many home-grown peppers as you can stand. Sweet and spicy. No egrets says it’s all the rage these days. Saute 4 or 5 cloves of garlic and one Tablespoon of whole coriander in olive oil. Add your chile pepper of choice (sliced and seeded, if you want it milder, keep the seeds if you want it spicy). After the garlic gets all sizzly and light brown around the edges, deglaze the pan with 1/8 cup of rice wine vinegar. Add 1/8 cup of fish sauce and 1/8 cup of soy sauce. Add most of a jar of all natural peanut butter. Mix it all together and until the peanut butter becomes saucy. Serve over one-and-a-half pounds of rice noodles. Add some combination of shrimp, tofu, chicken, julienned red peppers, bean sprouts, cilantro, crushed peanuts, cucumbers, and limes. It tastes good plain, too.